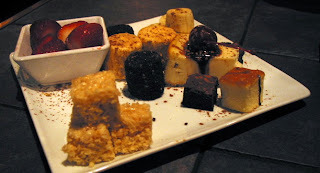 Have you ever been to the Melting Pot Restaurant? We are lucky to live about 30 miles from one and it's a fun place to eat - whether we are celebrating, or just for a good dinner! A few months ago we bought a $50 gift certificate to the Melting Pot Atlanta locations for $20 from Half Off Depot. It was set to expire on the 31st, so last Sunday we decided to go ahead and enjoy a night out there! 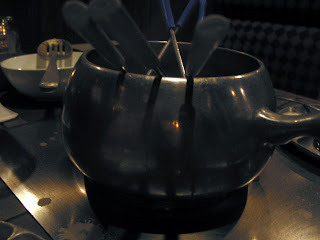 Fondue is more than a dining style, it's an experience! 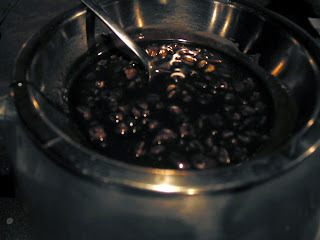 When we got to the restaurant, we were seated by a host, and he turned the pot on for our table so it could warm up. We looked at the menu while we waited, and decided to go with the Big Night Out France menu. We did make several substitutions though, which is a nice option the Melting Pot offers! For our cheese course, we chose the Wisconsin trio instead of the BNOF selection, which had truffle oil. We were warned that it was a very strong flavor, so we went with a tried and true cheese we'd like. Our cheese fondue was a mix of fontina, butterkase, and buttermilk bleu cheeses with white wine, sherry, garlic and scallions. Yum! It was served with a variety of bread chunks, green apples, and veggies. I love cheese fondue!! For our salad course, my husband went with the BNOF Salad Nicoise. I chose the House salad with their Sweet & Tangy House dressing. Delicious!! Filet Mignon, Peppercorn-Crusted NY Strip, Chicken Provençal,Roasted-Garlic Shrimp, Maple Leaf Farms Duck a l’Orange, Ratatouille & Goat Cheese Ravioli and Fresh Vegetables. Neither of us are fans of duck, so we substituted the chicken for the duck. If you've never fondued before, you should know that you will be cooking your own meats & veggies! That is part of the charm, and the fun, of the Melting Pot. We each had three forks, so we could cook several pieces at a time. 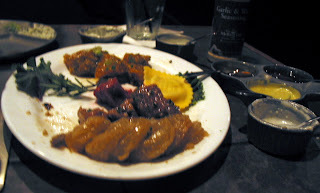 My picture of the meat plate was taken about 1/2 way through the course, so there was a good bit already gone! Prepare to be there for a while - our meal took close to three hours for all four courses. The veggies get dumped in the pot to cook, and you scoop them out with a slotted spoon when they are cooked. They give you a variety of sauces for the meat course. The BNOF sauce was a gorgonzola with port wine - it was too strong for my taste. There was also a tarragon aeoli, which I didn't try. My favorite sauces are the Green Goddess and Teriyaki. LOVE them! There is also a curry sauce and a ginger plum sauce. Then it was time for the best part of our meal - the chocolate course!! We didn't try the BNOF White Chocolate Creme Brulee. Instead we picked the Flaming Turtle - milk chocolate, caramel and chopped pecans, flambeed! It. Was. SOOOOO. Good!!!! My picture doesn't do it justice, at all. The lighting is very dim in the restaurant, and I didn't want to use the flash and draw attention to my secret photography! I also ordered a Burnt Almond Mocha dessert drink - I remember only that it had amaretto and Godiva chocolate. It was a wonderful companion to my chocolate-dipped treats. I don't believe we finished any of the courses completely. It's so much food. But it is delicious, fun and such a different experience from the usual dining out we all do. It gives us some much-needed time away from the kids to talk and catch up. But don't get me wrong, you can take the kids here too. My kids love fondue, because we have it each year on New Year's Eve! Katie's been to the Melting Pot several times. David hasn't been yet, but next time we go, we'll take them too. It's so much fun!! Do you live near a Melting Pot? Or have you ever been? I'd love to hear what you think of them too! This is not a sponsored post at all, I just wanted to share one of my favorite places around Atlanta!! I have never been and was scheduled to FINALLY go last week. With all the chaos with my folks, that will have to wait for another day. mmm, I've never been either. I keep telling my husband I want to go but we just never make it out there. Maybe next date night! cheese and bread? I am there!!! Love that place... mmmmmm good. 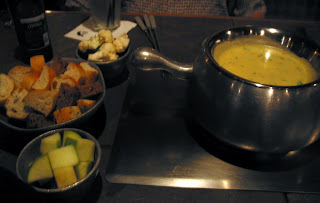 I never really got why someone would want to go to a fondue restaurant but after seeing all the yummy pics, I think I'll tell my boyfriend I've been convinced to go now, lol. Renae, I am so glad you liked the pics! They were not good without flash, I was trying to be discreet but next time, I'm turning the flash back on!! The food is amazing there. And it is a romantic date night when you visit the Melting Pot! : ) If you go, let me know what you think of it!